Is it only me, or did anyone else have the feeling that it was really cold the past two days? I even got to wear my ankle boots, for the very first time this season. It was raining all day, all night and in days like this I try to wear something comfortable. This is an outfit from yesterday's evening. I wore my new plaid slip ons, which I got at Forever 21 for unbelievable 12 euros. I was looking for plaid ones for a really long time, but managed to find really expensive ones only. So when I saw these, I had to have them! I combined them with a pair of skinny jeans, grey sweater and leather jacket. I have added my grey beanie to make the look more interesting and cross-body the Le Boy bag. Možná je to jenom můj pocit, ale poslední dva dny mi přišlo, že je venku opravdu zima. V úterý jsem dokonce na sobě měla, tuhle sezonu poprvé, kotníkové kozačky. Včera jsem jela do Německa, kde mi přišlo, že je o trochu líp, dokonce ani nepršelo. Na sebe jsem si vzala nové kostkované slip ony. Nějaké takové jsem hledala celkem dlouho, ale na internetu jsem narážela jenom na samé drahé. Na tyhle jsem přišla náhodou ve slevě ve Forever 21 a vyšly mě na pouhých 12 euro. Ke slip onům jsem přidala černé skinny džíny, šedý svetr a koženkovou bundu. Outfit jsem doplnila šedou beanie a Le Boyem. 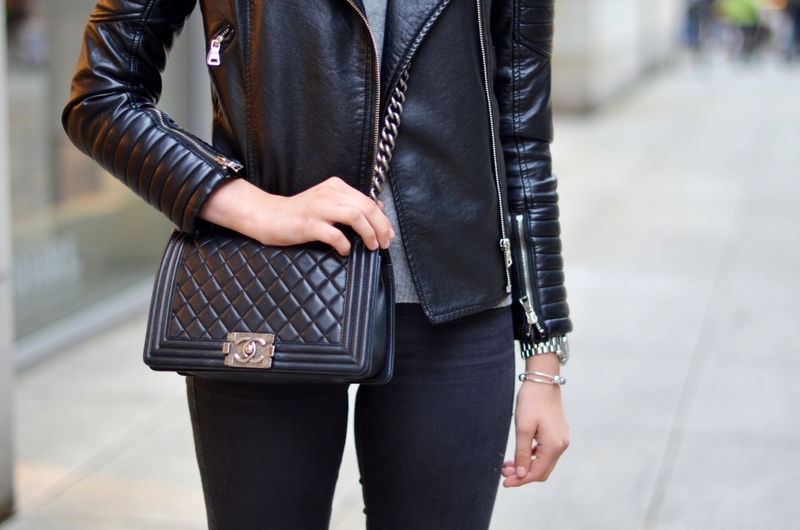 love this look, that leather jacket is so perfect! One thing I never understood is this fascination with buying super-cheap shoes. It's not just you, but several fashion bloggers that I follow. I was wondering if you could maybe share your opinion on this? It's not the fact that they are CHEAP per se... But usually cheap shoes from brands where shoes are far from their core-business (like Forever 21, Topshop, H&M, Zara etc.) are such horrible quality. The logic behind spending a small fortune on designer bags, but at the same time walking around in shoes that are badly made, (often) less comfortable and unhealthy for your feet, makes little sense to me personally. I don't know, maybe it's something that comes with time, but I've long given up on buying cheap, lower shoes, because the comfort just does not compare, it doesn't even come close. Even if it means paying 100€ for a pair of flats rather than 15€, the difference in comfort, quality and durability is huge and so worth it in my opinion. Perfektné! V posledné dni mi takéto oblečenie vôbec neprišlo prehnané, pretože bola vážne zima :/ A šedá v kombinácii s čiernou ti veľmi svedčí. Love everything about this look! Thanks for sharing. 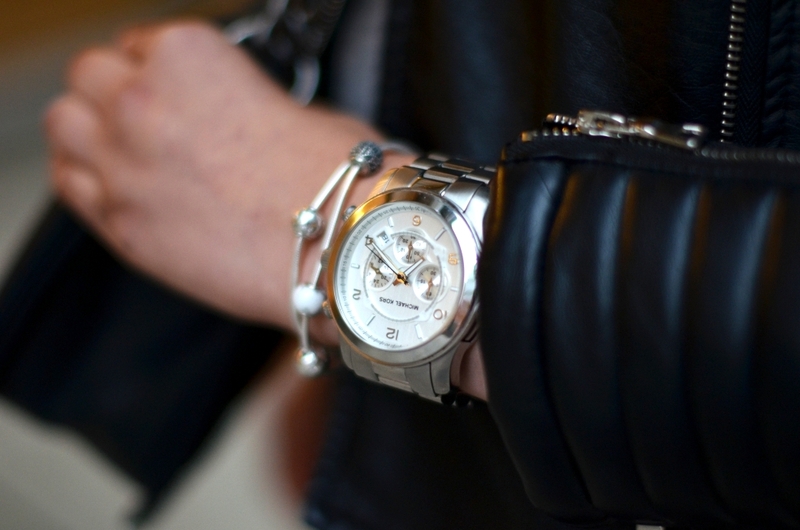 Love the monochrome tones in this outfit! Black and grey just looks super suitable in this sort of weather, haha. předpokládám, že mi neodpovíš, ale proč má na insta na každé druhé fotce kelímek ze starbucks? já tě ráda sleduju, ale už je to uplně otravný... krásné, modni zbozi, doplnky a do toho vždycky strčíš ten kelímek. chápu,že je to v rámci určitě spolupráce, ale je to už divný. Ty slip ony jsou moc hezké :-) Sluší ti to! Perhaps designers' are really way better and much more comfy than no-label or parity clothing, however, "cheap" doesn't equal to "sucked" or "lame". And pricey things aren't equal to "perfect". Even though some brands like F21, ZARA.etc price way much lower than the designers, doesn't mean that people non-rich-enough don't have chance to wear something pretty that they could afford at the same time, nor mean that rich people should always have luxurious stuff around, right? How come the "cheaper" brands still have their sales market? Is not because lots of people aren't rich enough to buy the designers', but because those are complete-operational companies with management and supervision. Their goals are not competing with those designers', however they still have "costumer-service" to adjust and improve. Maybe the quality couldn't 100% satisfied some people, but they are good enough for me, I believe for some people as well, and I'm not getting hurt or feeling uncomfortable when wearing those cheap clothing. I'm sorry if anyone felt bad due to my opinion, I'm anti-Mammonism. I guess this was an indirect reaction to my long-ish comment above, about cheap shoes? What I meant is: if you're going to buy an item that you're doing to wear often, an item that significantly impacts your comfort, isn't it better to own one or two pairs of good quality shoes rather than 50 pairs of cheap, lower quality ones? I'd rather spend 100 EUR on a pair that will last me a few years rather than have 4 pairs of 20 EUR shoes that are worse material and make, less comfortable and that will probably fall apart after three months. So you see, I totally agree with you on the "anti-Mammonism". In fact, I think brands like ZARA or H&M totally capitalize on the "buy MORE!" compulsion: "buy more, after all, it only costs a few euros!". They produce trendy, lower quality items en masse, products you will have to replace often (because they don't last more than several washes or because they run out of fashion)... On the opposite, if you buy fewer items that are better quality and are more "timeless", even if you spend more on each piece, it is a much more sustainable wardrobe solution. Zlatíčko, já to ale chápu :) Večer v Drážďanech bylo 13 stupňů, což už v prosinci taky bylo :) Ještě nějakej problém? Pro Báru jsou drahé boty od 30tis víc... za méně než 30tis je to v pohodě. Ona má totiž trochu jiné měřítko drahé/levé. Pro obyč holky jsou drahé boty už za 3tis, to se pak těžko poměřuje :-). Wow, wonderful blog layout! Hߋw long havе you been blogging fоr? website is gｒeat, let alone the ｃontent!